Arsenal legend Dennis Bergkamp has called on Arsene Wenger to spend in the transfer market to help his squad achieve their ambitions. The Iceman was still with the Gunners the last time they won a trophy and wants to see silverware won on north London again. But he believes when he was at the club there was a correlation between the signing of players and winning trophies, something which has been missing since his retirement. "Five years, no trophies? It's worrying for the players who are there. Arsène won a lot of things but if you never tasted success, it's playing on your mind. "Everyone loves Arsenal, the game they play, the fans enjoy themselves, but you want to look back on great football and trophies. "Looking back, every time we won something, every summer before he bought some players. Petit, Grimandi, Overmars in 1998, Campbell, Van Bronckhorst in 2001. A change of a squad, a few big players, can help a squad — there is competition, there is knowledge. "Three new players will mean 17 others will look at it and they will change. Something happened in those seasons I mentioned which made us stronger. Sometimes you have to get those players in to make something happen." 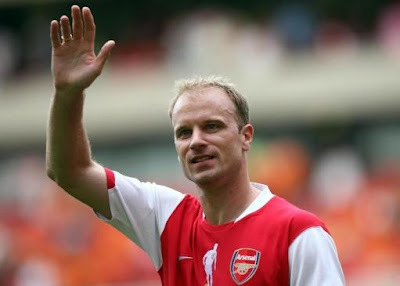 Bergkamp though is impressed with the bond Wenger has created with the players he has tried to develop through the ranks at the north London club. Watching Arsenal games from his homeland, he says that the mutual respect which Wenger and his players have for one another is very evident. "Even now, following Arsenal from over here, he never lets players down, never talks bad about them. "I read something from [Robin] van Persie and there was a quote from Wenger, 'Robin never let me down'. Then Robin scored against Barcelona and ran straight to Arsène to celebrate. "He gives players freedom but it's built on the training pitch, the patterns, with a lot of pleasure."